Old School Magic @ Eudemonia!!! October, 18, 2015 MARK YOUR CALENDARS! TheManaDrain.com > Vintage Community Discussion > Other Formats > Non-Vintage (Moderators: Matt, Klep, Godder) > Old School Magic @ Eudemonia!!! October, 18, 2015 MARK YOUR CALENDARS! 1) I am asking for this event to be Swiss + 1, so that there is no incentive to make an intentional draw, and so that the event won't take up the entire day and evening. 2) We WILL be changing Winter Orb to work like Eternal Central rules, so that Winter Orb "turns off" if it is tapped. These clarifications should be updated on the webpage soon. 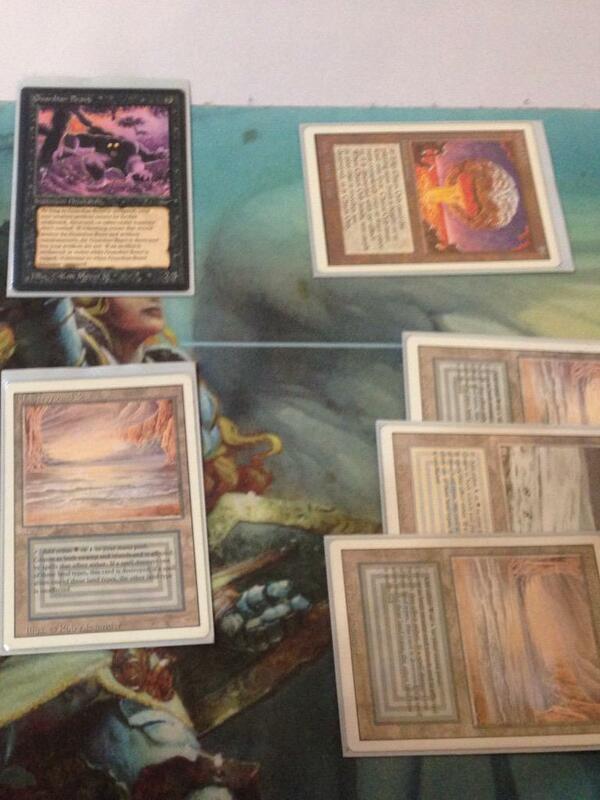 Re: Old School Magic @ Eudemonia!!! October, 18, 2015 MARK YOUR CALENDARS! The original announcement has been updated with special errata for Winter Orb. FYI!!! Should actually be able to make this one! Time to bust out the Relic Barrier / Winter Orb combo given that errata?? I still hate that this is not in the regional tournament announcement forum. I'm planning to be there barring any unforeseen catastrophes in the meantime. You'll get used to it . Maybe. But I might also miss future events because I was unaware and didn't happen to notice the post in a subforum that I don't visit regularly. spread the word and remind folks of this event! Have two decks sleeved up, still tinkering around with one of them. But have three interested players. We may try to throw a third deck together but probably have to find another playset of AQ Mishra's Factories in order to do so! It's hard to field multiple decks in this format from one collection, particularly trying to maintain a respectable level of pimpness across each. Please spread the word. Some folks still don't know about this! I always traded for 4th over Revised because of how much richer the inking in 4th was. Ruh roh. Smmenen: I don't know how much weight the words of someone like me carry, (I haven't logged in to TMD in about 10 years!) but for the next one of these, could 4th edition please be allowed? All the cards are reprints of already playable cards, with the SAME art and card frame. Chronicles, which is allowed, came out after 4th edition. You might get some more Sylvan Libraries, Land Taxes, and Ball Lightnings in the field... but then again, would that not be sweet? @FF: Somebody might have extra revised versions that you can borrow. I played a couple 4/5th Edition Verduran Enchantresses in one of the Old School events and no one said anything (though one was a color error misprint, the other was BB Japanese, and I did have an Alpha one also). Sadly, it turns out that Real Life does not seem to approve of me traveling to Magic tournaments anymore, so I'm not going to be able to make this one after all. Somebody please take some pictures this time! I think this is 4th place? Awesome stuff!! Thanks for the pictures I love seeing people's decks! Fun time and beautiful decks as usual. Here's a game state in my game 2 vs. Stephen. COP: Red was holding off Kird Ape, and then Mirror Universe came up to discourage me from continuing to attack with the factories. Stephen ultimately grinded me out that one and game 3. Here's a shot where not much appears to be going on, except everything along the top is set aside from the real game, while players shuffle up for the Shahrazad sub-game. Not sure if others have any "action shots". Steve, do you feel like Wizards would errata Chaos Orb to a sacrifice if it wasn't banned in normal formats? I have more photos from this event I'll try to upload in a tournament report some day. BTW, I'm going to schedule another Old School event for next year. As is our trend, I'd like to make one change. Does anyone have strong objections to trying out unrestricted Workshop?